Tamilnadu Palaces are great symbols of the Royal life once Tamil Nadu enjoyed. The magnificent sculptures and the artistic work are all time praiseworthy. Tirumalai Nayakar Mahal is located 1.5km north of Meenakshi temple, Madurai, Tamil Nadu, South India. It is an Indo-Saracen Palace, built by Tirumalai Nayakar in 17th century. Lord Napier renovated the palace in 1866-72 and later further restoration works were carried on. Today, the main attraction of the palace is light and sound show, which is based on the life of "Tirumalai Nayakar" and "Silapathikaram". The visiting time is from 9 a.m. to 5 p.m. The Sound and Lightshow, shown here is excellent. This show dramatizes the Madurai's past in English. This is a major tourist attraction among Tamilnadu. Shivaganga Palace is located in the Sivaganga District about 40 km from Madurai, built in 1730s. It was once the seat of Marava kings. This palace is also known as "Gowri Vilasam". Though this palace is in a dilapidated condition today the architectural beauty can still be appreciated. Inside the Palace there is the temple of Sri Raja Rajeshwari, which is open to the public in the evenings and on auspicious days. It is the family deity of the royal family. A huge hall supported with numerous pillars can be seen on the southern part of the temple and a palanquin in the front facade. There is a miniature swimming pool called "Nadai Kinaru" in the palace, meant for the womenfolk of the royal family. This monument also adds glory to the Tamilnadu Palaces. 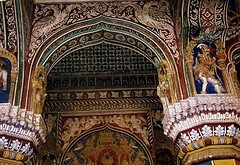 Tanjavur Palace is situated 55 kms east of Trichy in Tamil Nadu. It is also known as Great Fort. Tanjore, also known as Thanjavur, was the ancient capital of the Chola kings and later of the Tanjavur Nayaka and Maratha rulers. Tanjavur rose to glory, during the later Chola reign, between the 10th and 14th centuries, and became a centre of learning and culture. The Cholas were great patrons of art and built most of the temples. It was the practice of the kings to donate part of their wealth to the temples, for spiritual gain. Tanjavur's crowning glory is the Brihadishwara temple built by Raja Raja. 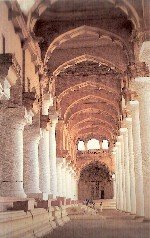 This is listed as a World Heritage site and is worth a visit. There are two towers in this palace, one of which was used to store weapons and to keep a watch on the approach of enemies. From the other tower the king offered obeisance to the deity of Srirangam Rangaswami. The Palace has huge halls, spacious corridors, observation and arsenal towers and a shady courtyard. Though many sections of the palace are in ruins, restoration work has been taken up. The palace houses a library(Saraswathi Mahal Library), a Museum and an Art Gallery. The Sangeetha Mahal or the Hall of Music is located in the first floor of the Palace.The Royal museum displays many items from the kings who ruled the place in past. The eclectic collection of royal memorabilia can be of interest to any visitor. The Royal clothes, hunting weapons, the head gears and many more such items are worth visiting. There are two Durbar halls where the rulers held public meetings. This great monument is an added attraction to the Tamilnadu Palaces. Fern Hill Palace is located at Ooty,around 1 km from Ooty Bus Stand. This former palace has been converted into a hotel now. Palace of Annamalai Chettiyar is a 110-year-old outstanding specimen of the Chettinad architecture. The oldest surviving building of this style, the Chettinad Palace was built by Dr Annamali Chettiyar, founder of the Indian Bank and the Annamalai University in Chidambaram. The Chettinad Palace was designed by Dr Chettiyar. The basic style of architecture reflects traditional architectural style of Chettinad. The construction material, decorative items and furnishings were mostly imported from East Asian countries and Europe. The marble was brought from Italy, chandeliers and teak from Burma, crockery from Indonesia, crystals from Europe and wall-to-wall mirrors from Belgium. This magnificent palace is a great monument to Tamilnadu Palaces, and a great tourist attraction.